IDW Publishing's Library of American Comics is a big deal. Mainly because it brings to readers a new look at some old classics, some of which may not necessarily be under IDW's ceiling. Some of the latest in that line include some great Superman tales, reprinting adventures of the Man of Steel that appeared in Sunday newspapers for more than twenty-five years. Superman: Golden Age Sundays will feature the strips released in chronological order in three sub-sets: the 1940s Golden Age, the 1950s Atomic Age, and the 1960s Silver Age. "We're printing the series in an oversized 9.25" x 12" format," says editor Dean Mullaney, "so that readers can fully enjoy these glorious full-color tabloid Sundays." 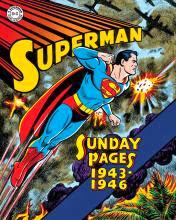 The first volume in the Superman: Golden Age Sundays series will collect 170 sequential Sundays, from May 9, 1943 through August 4, 1946, beginning where the Superman Sunday Classic book by DC Comics and Kitchen Sink Press left off. These World War II-era stories feature work by legendary artists such as Wayne Boring and Jack Burnley. The stories include the complete "Superman's Service to Servicemen" series, which ran from late Summer of 1943 until a few months after the Second World War ended. In these human interest tales, Superman responds to requests from men and women of the armed services, as well as their family members back home. In supporting troop morale, Superman travels from the Mediterranean theatre to the bleak Aleutian Islands to the steamy South Pacific. He helps a wounded Army Air Corps pilot return home to witness the birth of his twins; solves numerous romantic misunderstandings; checks up on mothers for their worried sons overseas...while simultaneously stopping enemy torpedoes, bombs, and bullets. In a clever transition to the post-War world, there's a flashback to Superman's origin and Clark Kent's first assignment at the Daily Planet, followed by a thrilling inter-stellar saga in which Superman comes face to face with Queen Arda of the planet Suprania, who threatened to kill Lois Lane unless the Man of Steel agrees to become her King! These Sunday strips represent an important era in the development of the Man of Steel into an international phenomenon. Each book in the series features an introduction by Mark Waid and covers drawn by Peter Poplaski. Superman: Golden Age Sundays joins The Library of American Comics and IDW's line of archival DC classic newspaper strips, first started with Superman: Silver Age Dailies, which will continue into 2014, as well as the 1940s Wonder Woman and the 1960s Batman. San Diego, CA (September 17, 2013) - Continuing to set the gold standard in comics preservation, IDW Publishing's Library of American Comics, in partnership with DC Entertainment, will release the amazing never-before reprinted adventures of Superman that appeared in the Sunday newspapers for more than twenty-five years. The strips will be releases in in chronological order in three sub-sets: the 1940s Golden Age, the 1950s Atomic Age, and the 1960s Silver Age. The first volume in the Superman: Golden Age Sundaysseries will collect 170 sequential Sundays, from May 9, 1943 through August 4, 1946, beginning where theSuperman Sunday Classic book by DC Comics and Kitchen Sink Press left off. These World War II-era stories feature work by legendary artists such as Wayne Boring and Jack Burnley. The stories include the complete "Superman's Service to Servicemen" series, which ran from late Summer of 1943 until a few months after the Second World War ended. In these human interest tales, Superman responds to requests from men and women of the armed services, as well as their family members back home. In supporting troop morale, Superman travels from the Mediterranean theatre to the bleak Aleutian Islands to the steamy South Pacific. He helps a wounded Army Air Corps pilot return home to witness the birth of his twins; solves numerous romantic misunderstandings; checks up on mothers for their worried sons overseas...while simultaneously stopping enemy torpedoes, bombs, and bullets! In a clever transition to the post-War world, there's a flashback to Superman's origin and Clark Kent's first assignment at the Daily Planet, followed by a thrilling inter-stellar saga in which Superman comes face to face with Queen Arda of the planet Suprania, who threatened to kill Lois Lane unless the Man of Steel agrees to become her King! These Sunday strips represent an important era in the development of the Man of Steel into an international phenomenon. Each book in the series features an introduction by Mark Waidand covers drawn by Peter Poplaski. Superman: Golden Age Sundays joins The Library of American Comics and IDW's line of archival DC classic newspaper strips, first started with Superman: Silver Age Dailies, which will continue into 2014, as well as the 1940s Wonder Woman and the 1960s Batman. Established in 2007 by Dean Mullaney, the Library of American Comics has become an authority on comic strip preservation and restoration. Their multi-Eisner and Harvey Award-winning collections present archival material accompanied by enriching information that frames the selected strips against the backdrop of history and culture.